If you had to include one quintessential story in the genre-defining anthology of steampunk, this would be a good choice: it covers all the bases, and is unpretentious enough to fill most stomachs hungry for a quick meal of the Victorian Bizarre. "A scientist-explorer Langdon St. Ives and his valet, Hasbro, pursue their arch-nemesis, the hunchback Dr. Ignacio Narbondo, across Norway, contesting Narbondo's plot to destroy the earth and, later, efforts to revivify Narbondo's apparently frozen corpse. 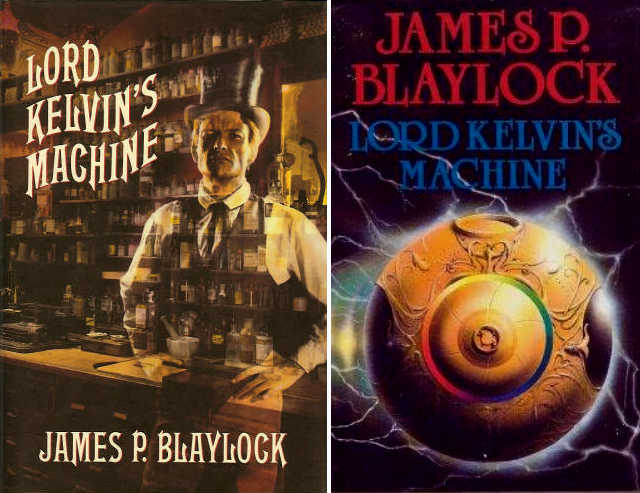 In the process St. Ives gains access to a powerful device created by Lord Kelvin, which allows St. Ives to travel through time." Quite an enjoyable steampunk romp through the (now already cliched) staples of the genre: deliciously cheesy arch-enemies, a plot spiced with mighty volcanoes and swell Victorian technology. Good stuff, recommended. "Myron Chester and the Toads "
"The Shadow On The Doorstep"